GOP lawmakers are none too happy with Gov. Roy Cooper threatening to veto a bill restructuring the State Board of Elections and Ethics Enforcement. Cooper told the News and Observer that he took issue with a provision in House Bill 1029 making campaign finance investigations completely confidential and that he wouldn’t veto the measure if lawmakers fixed it. Senate President Pro Tem Phil Berger and Rep. David Lewis (R-Harnett) issued scathing statements to media after Cooper’s threat. “Gov. Cooper laid bare what he’s sought for two years: partisan weaponization of the Board of Elections’ investigatory power,” Berger wrote. He went on to criticize Cooper’s choice to chair the State Board, Andy Penry, who resigned recently after the state Republican Party accused him of being partisan on social media. In his resignation letter, Penry said he didn’t want to take away from the State Board’s investigation into absentee ballot fraud in the 9th congressional district. The 9th congressional district investigation has been at the center of the back-and-forth between lawmakers and Cooper with regard to the future of the State Board. A three-judge panel ruled the current structure of the State Board unconstitutional, and it was set to revert back to the original law before Cooper took office. The same panel, however, has given extensions for the current State Board to stay in place as it continues the investigation. Berger indicated that by Cooper failing to issue his veto early, it obstructs the State Board from moving forward in the investigation. “Gov. 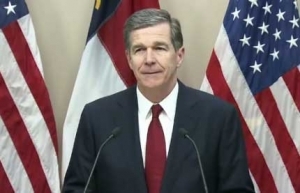 Cooper’s failure to act is holding the entire Board of Elections hostage, including the NC-9 investigation, in his effort to achieve unchecked power to launch corrupt and unfounded partisan attacks on legislators,” he wrote. He added that Cooper’s refusal to issue a veto was “intentionally ruining the holiday season” for cafeteria workers, clerks and non-partisan staff. Confidential investigations were not part of the State Board structure before these GOP legislators decided to add it in to the new measure.